The Encino Velodrome Assocation is a 501 (c) 3 non-profit organization. The mission of the Encino Velodrome Association is to provide instructional, training and racing opportunities for track cyclists. It is the vision of the Encino Velodrome Association to provide the highest level of satisfaction to our riders, racers, spectators and sponsors by providing safe, friendly, and fun activities. Park at your own risk. Softballs/baseballs fly anywhere. Smoking is only allowed in parking lots. 10mph speed limit at all times. WELCOME TO GRASSROOTS TRACK RACING AT IT'S BEST. Back in the early days at Encino, practically everyone's jersey looks the same; this would be a tough group to run a Madison race with... WOW! Look at that apron...how you would've wanted to stay away from it back when it was like this. 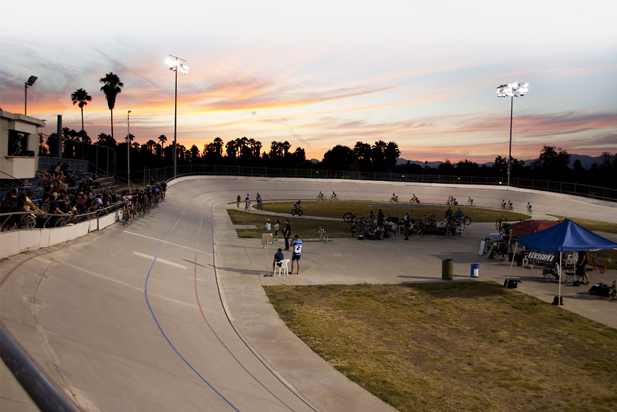 For over forty-five years, the Encino Velodrome has been providing instructional, training and racing opportunities for track cyclists of all ages. Site of the 1965 US National Championships, the 1968 US National Championships & US Olympic Trials, and the 1972 & 1973 Grand Prix of the United States (televised on ABC's Wide World of Sports), the Encino Velodrome is an all-volunteer run facility that relies on donations to run and maintain this historic facility today and for the generations to come. Help support the track. It all started in a rather casual way, four good friends, George Garner, Bob Hansing, Jack Kemp and Charlie Morton, all avid cycling enthusiasts and successful business men in the bicycling industry, out on a bicycle ride exchanging war stories and bragging a little to each other. Later that year, it was 1953, Charlie Morton was playing golf with a good friend from the U. S. Army Corps of Engineers who was a member of the West Valley Youth Organization, when the conversation turned to thoughts and plans for the future. When the golf game was finished, Charlie Morton had heard the story of a small piece of land owned by the U.S. Army Corps of Engineers, located in the Sepulveda Dam Flood Control Basin, begging for someone to do something with it. From these two conversations emerged a plan for building a velodrome for Southern California’s cycling community. The four men, George Garner, Bob Hansing, Jack Kemp and Charlie Morton, moving with conviction, formed a non-profit corporation and enlisted the help of the friends of cycling in Southern California. Importers, distributors, manufacturers, dealers and members of the cycling community were called upon for ideas, inspiration, and most important, donations. Toward the end of the fifties, the four founders, each investing a large amount of their own money, made arrangements to secure the land and begin construction of what we know today as THE ENCINO VELODROME. 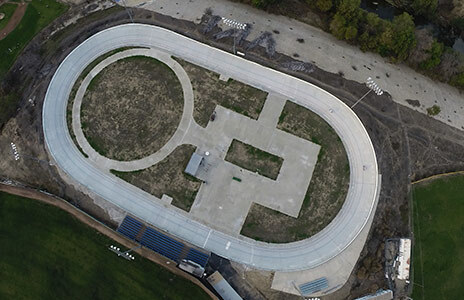 As expected, the instant the final grading had been completed and Garner, Kemp, and Morton stood together admiring their work, they looked up in silent amazement to see the fourth member, Bob Hansing riding his bicycle on the newly graded dirt oval. And so it was that Bob Hansing became material for Trivial Pursuit” and went down in history as the first person to ride the Encino Velodrome. 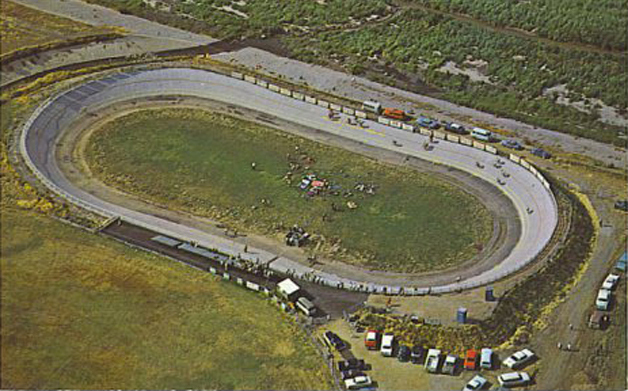 The track was finished and covered with a layer of asphalt in time to start the 1961 cycling season, with a spring season of track racing. 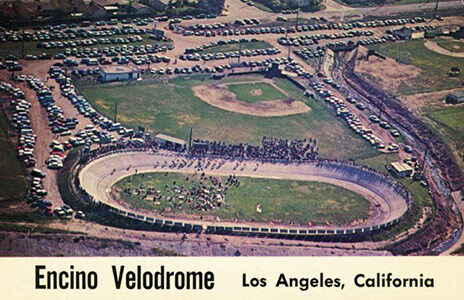 Racing at Encino Velodrome continued and grew; actually enthusiasm and support was so high that by by 1963, the four founders were able to cover the asphalt with a layer of cement. George Garner, Bob Hansing, Jack Kemp and Charlie Morton have left us with an example of what dreams, determination, and hard work can produce. They have also left us with a legacy and a challenge. The legacy is the physical plant: Encino Velodrome. The Challenge is to continue to improve and develop the facility SO that today’s youth and the youth of tomorrow, will have a place to learn and the opportunity to become champions like those that rode before them. It is with these thoughts foremost in our minds that we celebrate the 42nd Anniversary of the Encino Velodrome. The four founders, the many men and women who raced on this track and lots and lots of volunteers. Bob Hansing, a lifetime resident of the Glendale and San Fernando Valley area, died on February 2, 2001 at the age 69. Born in Glendale on October 21, 1931, he spent his youth in North Hollywood. He graduated from North Hollywood High where he met his wife Beverly. After serving 4 years in the U.S. Navy during the Korean Conflict, he permanently moved his family back to the Glendale area in 1955. He established two local businesses Montrose Bike Shop, which has been family owned for 46 years, and Euro-Asia Imports, a bicycle importing company. In 1951 Bob joined the Navy and married Bev while still completing Boot Camp. He earned a rating as a diesel engineman, graduating 3rd in a class of 80. His first duty was on a sub-chaser off Korea, which lasted 1'/2 years. Next he drew duty on an Attack Transport. It was while assigned to these ships that he gained his first exposure to Japan via the naval ports of Yokohama and Sasebo. While others headed for the bars Bob headed for the nearest Japanese velodrome. He borrowed a bicycle (far too small for his Western-size body) and got the feel of the oriental oval. During his final year in the Navy, he was assigned to Special Services. And when an Officer heard about Bob's bike racing background, he snapped him up to ride on Navy time: it seems the Marines had just gotten one of their men to set a cross-country record in the USA (18 days) and the Navy wanted that record. Even though the record attempt never materialized he was happy to be back on solid ground, doing what he enjoyed. After the Navy, Bob opened the doors of Montrose Bike Shop in February 1955 and moved it to its present location in 1961. He became one of the first importers of high quality European racing bicycles and components in the U.S. and most of his customers drove long distances to buy the exotic items he acquired. He founded the Montrose Cycle Club, which was an active club for over 35 years and counted several national and Olympic cyclists among its membership. Thus, Bob's natural inclination to sponsor racing, led him into the involvement with the Amateur Bicycle League of America, serving as a member of the Board of Directors for 15 years, as a coach of the USA Olympic and Pan American Teams, and as a member of the U.S. Olympic Cycling Committee. Bob was one of four founders who built the Encino Velodrome where he announced the races for many years while Bev worked the concession stand. He served as coach of the 1968 U.S. Olympic Cycling Team in Mexico City and managed the Pan-American team in Cali, Columbia in 1971. He was president of Shimano American Corporation, where he retired from Shimano in 1971. In 1973 he established Euro-Asia Imports, expanding his business to Japan. Bob and Bev enjoyed a wonderful life filled with d ear family and friends and happy travel memories.